Hamnet Shakespeare (baptized 2 February 1585 – buried 11 August 1596) was the only son of William Shakespeare and Anne Hathaway, and the fraternal twin of Judith Shakespeare. He died at age 11. Collen Wheeler who plays Elizabeth in Timothy Findley's Elizabeth Rex, grounds the production as soon as she enters. In her deep voice, she makes sense of everything she says. And with her commanding stillness and monumental depth of feeling, she makes the queen’s anguish agonizingly concrete. Wheeler’s Elizabeth is a huge artistic achievement. Then actor/swordsman C.C. Humphreys played Jack Absolute in Richard Brinsley Sheridan’s (1781-1816) The Rivals and Shakespeare's Hamlet, both on the London Stage. The swashbuckling character Jack Absolute was so appealing to Humphreys that he traveled in 2002 to Vancouver (he had relatives), crashed at then Vancouver Writer’s Festival Director, Alma Lee’s basement and wrote his first Jack Absolute novel, That first book, Jack Absolute led to two more and seven independent novels plus three under a different name Chris Humphreys. Humphreys's prequel, 2004, The Blooding of Jack Absolute contains what I think is the best recounting of the battle on the Plains of Abraham. In a magical moment in the novel Jack Absolute, Absolute goes to the opening of Sheridan’s play The Rivals and buttonholes him in a corner and challenges the man for writing him into the play. You don’t have to be Argentine (I am) or a Borgesian fan (I am) to note the labyrinthine connections of an actor playing a character who then as a novelist writes about the character. And if you do a bit of research you might find out that Humphreys’s obsession with Hamlet (one common to any Shakespearean actor young enough to play Hamlet but not old enough to play Lear) is understandable. Humphreys who has been a stage and film fight director (giving advice on how to swashbuckle) has combined his interest in Hamlet and sword fighting for his novel, 2013, Shakespeare’s Rebel. The leading protagonist is both an actor and a sword-fighter. It is from this novel that Humphreys adapted into a play, Shakespeare's Rebel for this year’s Bard on the Beach. There is one key scene in this play in which Robert Devereux, Earl of Essex (John Murphy) surprises Queen Elizabeth (Colleen Wheeler) in her bedchamber (after leaving a war in Ireland, with the express prohibition to do so by the queen) that leads to the events in the end of the play all documented in history. For those who might know a bit about Shakespeare, his times and that of Elizabeth most of the events of Shakespeare’s Rebel have been historically documented within the haze that anything about William Shakespeare’s life has always been surrounded by. Thus the actor/swordfighter/boozer John Lawley (played nicely by Benedict Campbell) is a made up character (C.C. Humphreys mixed with Jack Absolute) who looks into the events of the time from the outside/inside. There is a reference in the play (a suspicion with many Shakespeare scholars) that Shakespeare himself played Hamlet’s father, the king. And many of these scholars including Harold Bloom have speculated on why Shakespeare’s son was called Hamnet. With all that I can truthfully say that Rosemary and I enjoyed Sunday’s performance of Shakespeare’s Rebel. The fight scenes were as accurately depicted as safety can allow. Ancillary to this is Humphreys’s account that the English way of fighting, the back sword and the small buckler (a shield) was superior to the Spanish method of sword and rapier. In fact there is such a fight in the play. If there is one measure of possible confusion for those who have never been to a Bard play before, this is the Shakespearean tradition of using actors to play several parts. Bard is in the black because they know how to be frugal. Thus the actors in King Lear, play on a different days Shakespeare’s Lear and Hmphreys's Shakespeare's Rebel. Campbell is King Lear as well as Lawley. Years ago (about 28 of them) I saw in an early version of Bard on the Beach a Richard III (with Gaze as Richard) in which the people who were killed appeared over and over in other parts. I was confused but no more. The problem (a small one) in Shakespeare’s Rebel lies with only one man, and that is David Marr (Sir Samuel D’Esparr). Marr has perhaps the most recognizable voice (could never get a job in CBC Radio as he has perfect diction and no speach impediment) in Vancouver theatre. When he plays other parts it is very difficult to see a difference. As it is Marr as D’Esparr (with a huge belly) is one very funny man. In my years as an editorial photographer and infrequent journalist I have met critics of all kinds. Some of them like the Vancouver Sun’s Lloyd Dykk (deceased) and Peter Birnie, Christopher Dafoe (the Globe arts critic son of the notable theatre critic Christopher Dafoe) and the Straight’s Colin Thomas. There is a defining quality in all critics that is a borderline between being critical and being vicious. The above critics have been borderline vicious in their time but their pieces have been done with a modicum of class and good taste. I remember fondly Stanley Kramer who in the late 70s introduced films for the Bellingham TV channel KVOS. His explanations and pointers on what in some cases were bad films were interesting and never cruel. The Vancouver Courier’s Jo Ledingham always has enthusiasm on her face. She might not like a play but (most important) she likes theatre. Last year I ran into both Christophers Dafoe at an Arts Club Theatre opening. Elder Dafoe had that glint in his eye. That glint of excitement. He was there to see a play. That action was exciting even though he may have reviewed hundreds of plays in his past. When I read columnists and critics who get vicious I think of Mao Zedong. As an invited managing editor (as an example) of the Vancouver Sun, Zedong would periodically ship his reporters, columnists and critics to a pig farm in Surrey for a few weeks. They would shovel it. They would then return to the Vancouver Sun newsroom refreshed and delighted to be back. Except for a few columnists my Vancouver Sun is a waste of time. The decline of the Sun (can we blame the free internet?) began when columnists, reporters and writers who had good health plans and benefits were given packages to leave. Many, who saw what was coming, did just that. Then the Vancouver Sun hired freelancers and gave then no benefits and meager payment. The broadsheet, recenlty became less broad. That is when it (the Vancouver Sun) all became a waste of time for me. Colleen Wheeler, who is a natural mezzo-soprano/alto has an uncommonly low voice. With that voice and stage presence (red hair helps!) she gave us a memorable Ulysses in Margaret Atwood’s play The Penelopiad. 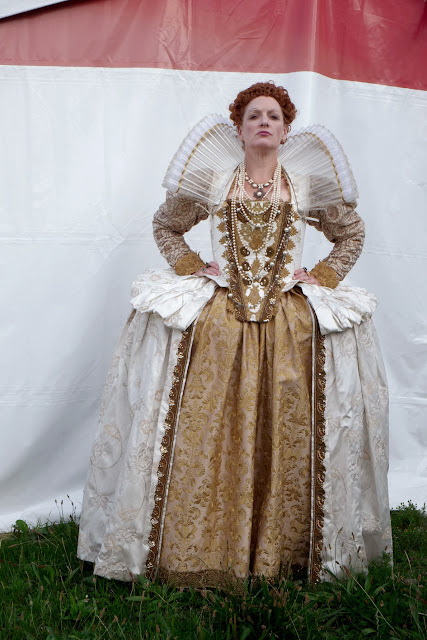 Wheeler’s costume that transforms her into Elizabeth Rex (she played Elizabeth in Timothy Findley's Elizabeth Rex was designed by Christine Reimer and is spot on. Taking Wheeler’s photograph, by one of the tents, a few minutes before Shakespeare’s Rebel began transported me to a time when I felt I must be careful or I would lose my head. I also thought, if Wheeler were a high school principal; there would be no discipline problems. One small inaccuracy in Shakespeare’s Rebel. The Earl of Essex’s head was severed only after three blows (not one) by the axe!